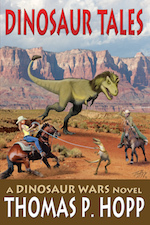 ← Book 5 of the Dinosaur Wars series is here! Things are really moving and shaking around here. 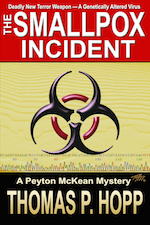 With one book just released and still in its early days, I’m halfway through writing the next. I hope you’ll enjoy them both. Let me start off with the new project. 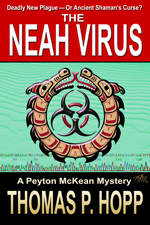 After months of preparatory research I have begun to write my second natural disaster thriller tentatively titled, “Earthquake–Seattle!” or words to that effect. It’s about… um, do I really need to tell you? One of the most difficult aspects of researching this story is that there are so many cracks in the ground around Seattle that it’s hard to pick a favorite (or is it un-favorite?). There’s the Southern Whidbey Fault Zone, the Darrington–Devil’s Mountain Fault, the Saddle Mountain and Rattlesnake Mountain Faults, not to mention the Olympia and Tacoma Faults, or the granddaddy of them all, the Cascadia Subduction Zone, a huge fault that runs the full length of Washington State’s Coastline. 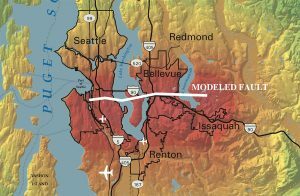 Eventually I settled on the Seattle Fault, because, well, it’s closer to home. That’s a model of it above, in which the color scheme runs from green denoting not-so-much shaking, through yellow to orange, where you ask yourself, “What was in that drink? I can hardly keep my feet!” to red, where you are thrown to the floor and your house starts crumpling around you. So what are you waiting for? 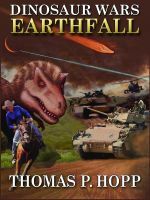 Even if you are the world’s slowest reader, you can easily finish Kit Daniels Dinosaur Girl long before Earthquake—Seattle is published. 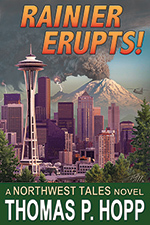 This entry was posted in Author, Nature, Northwest Tales, Seattle and tagged Seattle earthquake, Seattle Fault. Bookmark the permalink.